In the late fall (1988), I sat at my bedroom shrine for the first time in many months. It had been more than a year since the psychic flame which had sustained my spiritual life had been extinguished. I was in a somber mood. I folded my hands and looked at the picture of Guru which had started me on my spiritual journey seven years earlier. Though sad, I remembered from whence I had come -- who I had been before I took up the path -- and conjured a pure feeling of gratitude in my heart. Bowing my forehead to meet my folded hands in front of me, I offered my occult gratitude to Guru for everything he'd done for me. I am eternally grateful for everything you have done for me and for my brother and sister. It is a debt I will never be able to pay. Unfortunately, I have lost my aspiration and am certain it will not return. I'm sorry that I have failed you. I then folded the note twice and placed it back on my shrine, where it would sit for the next few months, while I mustered the courage to leave the Center. 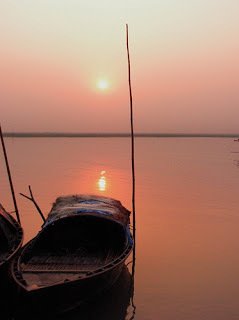 Photo credit of the sunset over the Ganges here.